I will show you Constructions designated as National Treasure in this page. Among 'Tangible cultural properties', the ones designated by the nation (Minister of Education, Culture, Sports, Science and Technology) are called 'Important Cultural Properties'. And the properties among 'Important Cultural Properties' which are especially highly produced and historically significant are designated as 'National Treasures'. Important Cultural Properties are divided into Constructions and Arts & Crafts. In 2008, the number of Constructions designated as Important Cultural Properties is 2344 (4272 buildings). Among them, National Treasures are 214 (262 buildings). Followings are the example of Constructions designated as National Treasure. 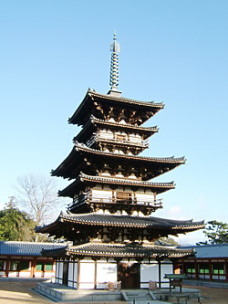 Shrine is the religious establishment which is built based on the shintoism belief. 37 shrines are designated as National Treasure. For more information about Shintoism, please see Shinto. Followings are the examples of National Treasure. Temple is the religious establishment which is built base on the Buddhism belief. 154 temples are designated as National Treasure. The existing castles were built between Sengoku Era and Edo Era (16-19th century). Castle was the residence and base of the defence of feudal lord. It was also the symbol of power. They are divided into 3 categories. Yamajiro (castle built on the mountain), Hirayamajiro (castle built on the hill facing flatland) and Hirajiro (castle built on the flatland). 8 castles are designated as National Treasure. Residence means here is the residence or guest house in the castle, shirine and temple. No folk dwelling is designated as National Treasure now. 12 residences are designated as National Treasure. Most of them are in Kyoto and followings are the examples. There are only 3 'Other Constructions' designated as National Treasure. North Noh Stage of Honganji Temple (Kyoto Prefecture), Hall of Shizutani School (Okayama Prefecture) and Oura Cathedral (Nagasaki Prefecture) which is the only one western style construction.